Folks… did you happen to catch this little blurb at the bottom of the Imagination TV page? It’s just unbelievable Mr. Steven Samblis would make a statement like this, let alone post it for the world to see. The last sentence is the most ridiculous part of the statement… “The agreement was cancelled for non performance“. Wait… is Mr. Samblis saying he cancelled the contract with himself, because he didn’t perform ??? Isn’t Mr. Samblis, as CEO of Imagination TV, (the public company), the one who decided what actions the public company was to take? So… would it also be true that the funds used to start Imagination TV, (which was touted as part of the public company), now just gone, or could it be said confiscated (or perhaps forfeited), by the owner of Imagination TV – the non-public company, wholly owned by Mr. Samblis (who wholly owned the public company)? This seems just bazaar ! If you’re scratching your head over this, you are likely not alone. Investors could also ask… did Mr. Samblis just abscond with what little assets the public company may have had, and leave investors holding the bag? Would this be some kind of punishment for any investors still invested in the company? Or, did Mr. Samblis start the Imagination TV entity with “personal” funds, and therefore he considers Imagination TV (the non-public company) not, (or ever was) part of the public company? Maybe Mr. Samblis used his salary as CEO of the public company to fund the Imagination TV endeavor, and therefore the public company has no claim to the “private” entity. But wait… Mr. QueFine states Mr. Samblis never took a paycheck from the public company, so how does that work ??? Folks… this may need more investigation. Something just doesn’t seem right, or as some may say… legal ! How does the CEO of the public company lead investors to believe he is working hard to start other revenue streams for the company, then just decide to divert any fruits of that labor to his “personal” company – then deem the public company did noting, and therefore deserves nothing ??? So, it appears that if investors had even a glimmer of hope this company would (or could) turn around, they now see the writing on the wall – the imaginary wall that investors were led to believe was real ! One thing seems for sure… Mr. Samblis does have a marvelous “Imagination” ! Uh-Oh… here we go again – #2 ! Yes folks… here we go again. 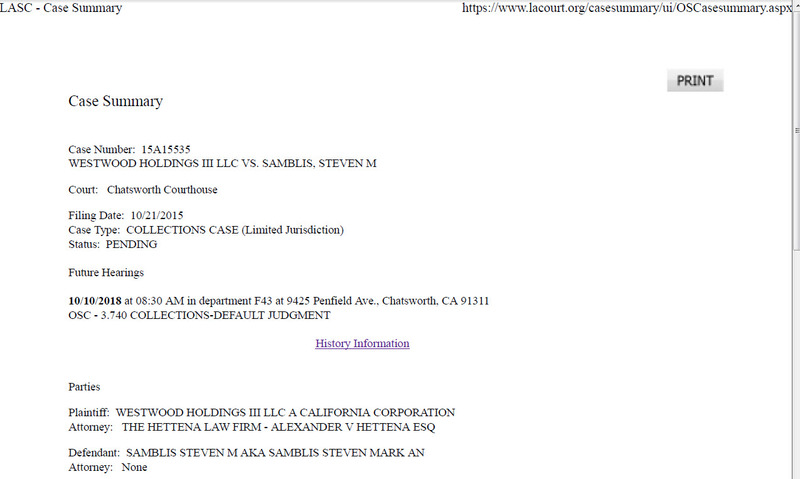 As we reported just a little over a year ago (9/3/2015) here, Mr. Steven Samblis appeared to be having some legal issues with paying his rent. Well, it appears that issue has not been resolved. As can be seen by the above graphic (click to enlarge), or the full document here, there appears to be a new legal action resulting from last year’s issue. One could assume by the “Case Type”: COLLECTIONS CASE” that perhaps either Mr. Samblis failed to live up to a previous agreement, or, he is behind in his rent again. However in what may be a bazaar twist, it appears the attorney may have some issues collecting on the debt due to failure to file proof of service, and failure to file a default judgment. Even if this is accurate, it is unlikely to cause the collections action to be dismissed. If Mr. Samblis owes the money, the attorney will likely refile the action with the proper documents attached. There also appears to be a typo in the future hearings date, as it is listed as being in 2018. Common sense would indicate the court is not that far backed up on cases that they are scheduling cases 3-years out. Now… why is this bit of news relevant and important? Well, if Mr. Samblis is having problems paying his rent, how could he possibly have the funds to incur the cost of filing the company’s financial reports with the SEC? How could he possible have the funds to fulfill any of the initiatives he has touted in his recent press releases (albeit on social media venues)? How could he possibly have the funds to fulfill launching new networks, shows, or new anything ? Perhaps a clue resides in this excerpt from one of our previous posts here. Mr. QueFine (many believe strongly that this is Mr. Samblis) seems to indicate that they “clearly did not have the funds to follow through” on the publicized initiatives. Mr. Samblis might be more accurate if he started calling the initiatives touted in his press releases, ideas, rather than lead the public to believe there is a likelihood, or even a possibility, that what is being touted could ever become a reality. Perhaps then Mr. Samblis would not have the need to delete such announcements at a later date when it has become too obvious that the touted initiative will not be coming to fruition, as detailed in the MilesBlue42 post here. So folks… do your homework on the history and facts on this company prior to investing in such. There is a ton of information available to you with just a simple Google search. Take the few minutes to Google the company, or the man behind the company, Mr. Steven Samblis – you will be glad you did.